It’s time to update your sites with the latest 10% off discount code! 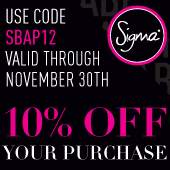 The code SBAP12 will be valid for 10% off your entire purchase from November 1-30. With the holiday season approaching, sharing a 10% off code can be a great way to encourage your customers to purchase. Keep reading to get the latest banners and tips for sharing the code! How will you be spreading the word? Thanks for the update! A bunch of my friends are planning to gift Sigma brush sets for the holiday this year. I know everyone will appreciate the coupon! That is great to hear! Thanks Katherine! How about the free gift with over $30 purchase?? It will be the travel sized E25! Oh and! SBAP12' Doesn't work. Instead 'SBAP2012' works. Hi Juliana! 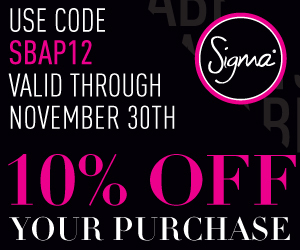 The discount code SBAP12 is valid from November 1st to the 30th!